thanol synthesis and for hydrogénation and desulphurisation in refining and in petrochemicals. A preheated mixture of steam and hydrocarbon, usually natural gas, is passed through tubes containing a nickel-based catalyst, which are heated in a furnace primarily by radiant heat transfer. Typical conditions would be 30 bar pressure, a 3 to 1 steam-to-carbon ratio and a tube outlet temperature of about 900°C. The reaction products are primarily CO and H2 together with steam, CO2 and a little unconverted methane. The gas mixture is passed through a waste heat boiler, which cools the gas to about 350°C to 400°C. The gases then pass through a catalytic reactor where the shift reaction converts CO and steam to CO2 and H2. The gases are cooled and H2 is separated in a pressure swing adsorber (PSA). The CO2 can be separated before hydrogen purification, using an amine scrub system or a more complex PSA system can be installed that produces pure CO2, pure H2 and a waste gas stream. The hydrogen purity can be >99.99% with a typical recovery of 90% from the feed gas. CO2 recovery from the feed gas would be >95%. The waste combustion products from the furnace, which are at a temperature of about 1000°C, pass through a convection heat exchange section where they are used to preheat the reformer feed and produce steam. The disadvantage of this system is that the furnace waste gases, which are derived from the PSA waste gas together with additional natural gas as fuel, contain CO2 that would need to be removed before discharge into the atmosphere with a separate amine scrub unit. The autothermal reformer process (ATR, Figure 6) is a closed system in which a hydrocarbon fuel is partially oxidised in an exothermic process, with pure oxygen in a burner converting part of the hydrocarbon feed to CO and H2. The high temperature gases then pass through a nickel-based catalyst bed where the endothermic steam/hydrocarbon reforming reaction takes place converting most of the remaining hydrocarbon to CO and H2. The downstream units are then identical to the steam hydrocarbon reforming plant. The advantage of a closed system is that it allows all of the CO2 to be removed at high partial pressure from the high pressure product gas stream. The reactor exit conditions are typically 1000°C and 30 bar pressure. The ATR can be scaled up to very large sizes. It is currently being used to generate the (CO +2H2) synthesis gas required for the new Fischer — Tropsch hydrocarbon synthesis plants being constructed in Qatar for the Oryx project (SASOL/Kuwait Petroleum). Fig. 8. Convective reformer fied in a PSA unit. The high-temperature gases produced in the partial oxidation reactor are either quenched by direct contact with water, or passed through a waste heat boiler for efficient heat recovery. There are a number of partial oxidation processes available. The high temperature H2 + CO rich product gas from either a POX or an ATR reactor can be used as a heating medium in a tubular steam/hydrocarbon catalytic reformer to replace the radiant heat transferred from a burner. This greatly increases the overall thermal efficiency of the process and systems for both ammonia (ref) and methanol (ref) that have been demonstrated. 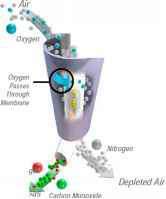 There have been a number of small plants designed to produce H2 for use in a fuel cell electric power system, either for power production or as a pure hydrogen supply for a demonstration fuel cell powered vehicle fuelling system. One of the most interesting of these is proposed by Heatric (ref) and is based on the use of a high temperature diffusion bonded heat exchanger consisting of etched channels. The process is based on steam/natural gas reforming with catalyst inserts in the heat exchanger feed passages where endothermic steam-methane reforming reactions take place and alternate catalyst filled passages in which there is exothermic catalytic combustion of fuel gas with air (Figure 9). Additional sections of the heat exchange blocks are used for steam production, shift reaction, natural gas purification and heat recovery. The crude product hydrogen stream can be purified in a small PSA unit. 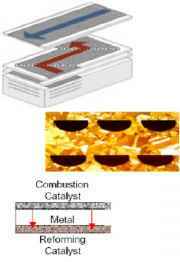 Catalyst can be a surface coating or a porous insert. Need to match the heat release rate with the steam hydrocarbon reforming rate. Certain mixed metallic oxides can be used to produce a ceramic membrane, which has the ability to simultaneously diffuse O2- ions and electrons at temperatures above 700°C. The oxygen ions are formed on the surface from an air feed and electrons pass counter-currently through the ceramic from the other surface where the oxygen ions leave as oxygen molecules. The oxygen ion transport membrane diffuses oxygen when there is a difference in oxygen partial pressure across the membrane. 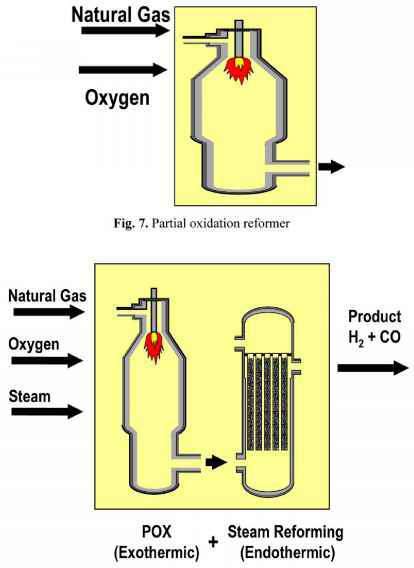 If the O2-ion transport membrane is placed in a stream of preheated natural gas and steam, in the presence of a catalyst, the diffusing oxygen will be consumed in an exothermic combustion reaction with the heat release being used in the endothermic steam — natural gas reforming reaction. 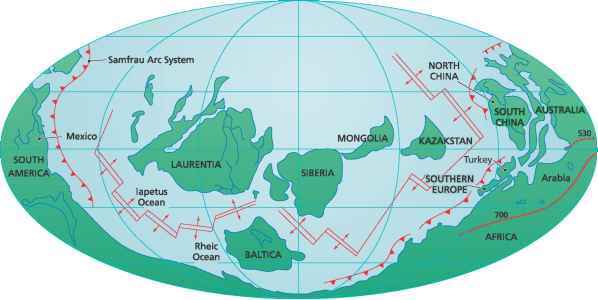 The system is, in effect, an autothermal reformer with internal oxygen generation. 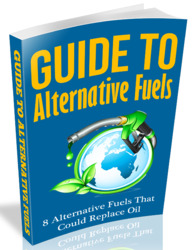 This system is currently under development by a consortium led by Air Products. The production of hydrogen in a catalytic process can be carried out with the simultaneous removal of CO2 from the reaction system by adsorption using a high temperature adsorbent such as a modified hydrotalcite (ref.). The combined reaction and CO2 adsorption can be used to simultaneously produce substantially pure H2 and pure CO2. The process, which is under development, is carried out in a multibed high temperature pressure swing system. A similar enhancement of the steam/hydrocarbon reforming or shift reactions can be achieved by introducing a H2 diffusion membrane into a reformer catalyst tube so that the hydrogen produced is continuously removed as a pure product at a lower partial pressure. The diffusion process can be assisted by using a sweep gas such as steam to lower the hydrogen partial pressure on the downstream side of the membrane. The preferred material for the membrane is a thin palladium and silver alloy deposited on either a porous ceramic or stainless steel carrier. Systems are under development in many countries.